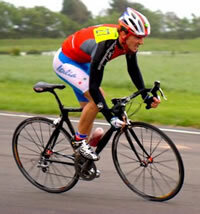 I have now been racing bikes for over 25 years, which means that either I haven’t grown up or I should know better. I regularly compete all over the country and train every day, plus 2 evenings a week and for most of Saturday unless of course it is raining and far too wet to do anything else but stay in. Unbelievably I am still married. I have been in the Guinness book of Records for endurance cycling with some team mates, I have represented my country but I have an overriding passion for the bicycle and the technology involved in building it. I started off helping people who compete with position and set up and it has just taken off from there. Your bike is not just a job number and my work is not 9-5. My philosophy is that I would be happy to race your bike. Click here to see an article about me from cycling weekly. Click here to see an article with me in Cycling Plus – Gower Rangers. Click here to see an article with me in Cycling Plus – Reservoir Cogs.